Prestigious fashion brand EnRootz will make its first appearance at Couture Fashion Week New York with the presentation of its latest collection. Part of the 26th season of Couture Fashion Week New York, the fashion show will be held at 6:00 pm on Sunday September 10, 2017 at the Crowne Plaza Times Square Manhattan, in the heart of the Big Apple. EnRootz is a USA-based clothing line distinguished by its impeccable alloy of traditional elegance and modern style. The brand’s distinctive fabrics, designs and colors reflect an Asian cultural influence, but also convey a wide appeal to a global market. All EnRootz designs are handmade and unique. Each piece goes through a rigorous creation process taking several days of expert work and craftsmanship. The driving force behind the EnRootz brand is the team of Mukta Ghangas, Manoj and Neeta Singh. Each has their own specialty. Fashionista Mukta Ghangas is fond of custom-designed, fashionable, stylish, elegant and beautiful clothing. She is the designer and the heart of EnRootz. 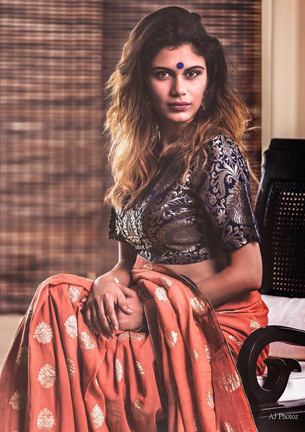 Mukta lives and breathes fashion, and style and innovation are her guiding principles. From designing the ensemble, choosing color combinations, and determining the type of fabric required – all the detailing is done by Mukta. Manoj Singh is the business force, branding expert and brain of the EnRootz brand. Manoj not only handles branding, but also operations in the USA. He deals with the when, what and how, and he is guided by a singular focus and goal orientation. Neeta Singh turns Mukta Ghangas’ creative vision to reality. She is the soul of EnRootz, from procurement to overseeing production. With a keen eye and understanding of fashion, Neeta takes care of operations in India and works in complete sync with Mukta’s vision. Team EnRootz’s vision is to continue to build and achieve international success for this unique and high quality brand.